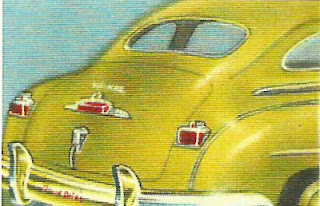 The tartan-weave grille made the 1946-1948 Dodge easy to tell apart from the 1942 models. The number '9' at the beginning of the serial number indicates that the vehicle was built by workers at Chrysler Canada in Windsor, Ontario. As the 20th Century opened, Horace and John Dodge were already well-established Detroit City machinists, parts suppliers to railroads and of auto parts to a very young industry. 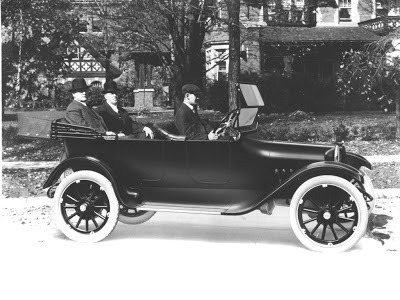 Noted for their flawless work, one of their first automotive customers was Ransom Olds. Olds ordered transmissions for his new horseless carriage, the Oldsmobile. Soon the brothers were selling entire running gears to Henry Ford for his self-propelled creations. John Dodge once said laughingly, "Someday people who drive Fords are going to want an automobile." When the red-headed brothers got around to putting their own name on car in June 1914, it was a hot ticket. They would give Ford a run for his money. Closer than two peas in a pod, John and Horace called the car--fittingly--Dodge Brothers. Three Dodge Brothers cars were used by the US Army in 1916 to capture Mexican bad guy, Pancho Villa. In building their car, the boys had a hurdle to overcome. They were naturally at ease with all things metal and mechanical but body and coachwork was a new area for them. 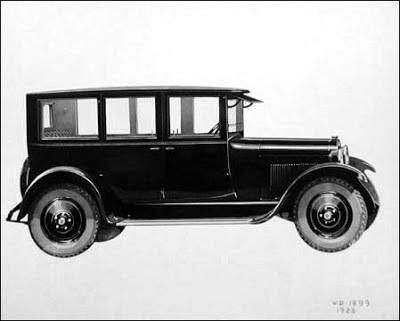 The Dodge boys did not like or understand wood, the main component of automobile bodies. They settled on a novel idea borrowed from the railroads--an all steel body--and got Edward Budd of railway renown to build them. 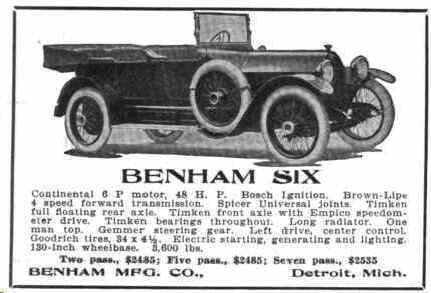 A total of 60 Benham Six cars would be built from 1914 to 1917 when the company ceased manufacture. 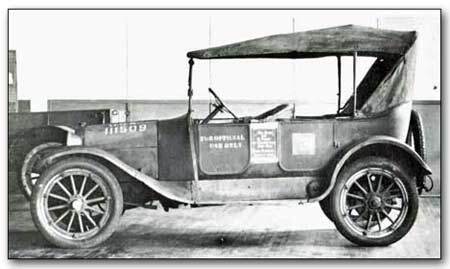 Only one of more than 100 new makes to be introduced in 1914, within two years Dodge Brothers had jumped to number four in the American sales game with a vastly superior product. Business was pretty good for the boys who incorporated themselves as a Canadian company in 1917. 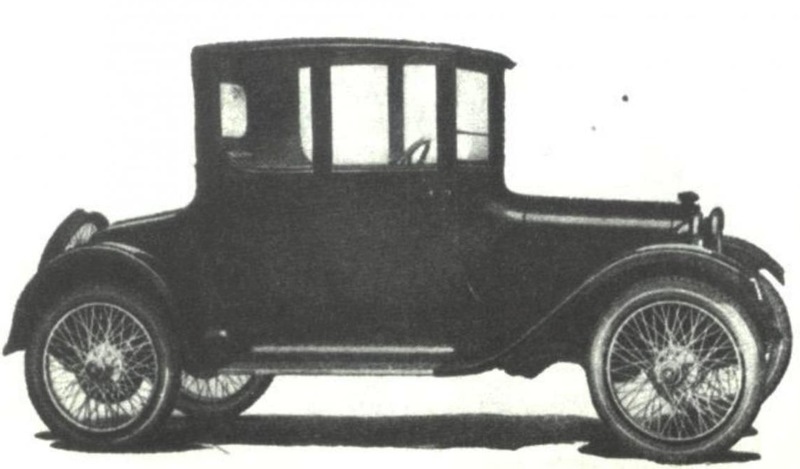 By the end of World War One, Dodge Brothers was solidly in the big leagues Stateside as an inexpensive automobile, second only to the low-price king, Ford itself. 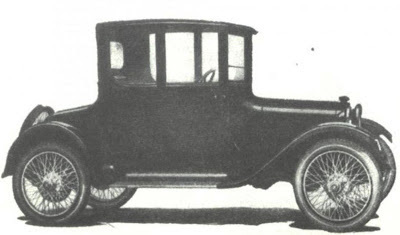 1921 Dodge Brothers Three-passenger Coupe. Business boomed to the point where in June of 1921 Dodge Brothers rented a dockside building from the Canadian Pacific Railway in Windsor, Ontario for use as their distribution point. Final assembly on cars for the Canadian dealers in the rented CPR wharf building. In February of 1924 the company moved to nearby Walkerville into a much larger facility. Thirteen months later Dodge Brothers moved again, this time into a full-scale factory on Dufferin Street in Toronto, which it shared with Graham trucks (in which the Dodge Brothers held substantial interest). The brothers died in 1920 and in 1925 their widows sold the company to their bankers for $146 million. 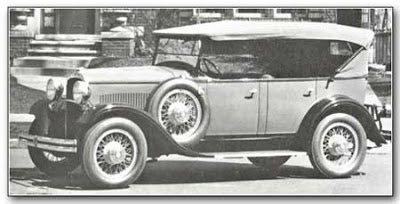 Dodge Brothers became a division of Chrysler Canada in 1928 when Walter Chrysler's fledgling corporation bought the huge independent automaker lock stock and barrel for a cool USD$126 million. Newspapers reported the deal as 'the minnow that swallowed the whale.' That price included the Canadian subsidiary. The new Toronto factory didn't fit in with corporate plans as Chrysler had already purchased a large tract of land in the country outside of Windsor where a factory was already under construction. When the enormous plant opened in 1929, the Dodge Brothers factory in Toronto was phased out. Slotted just above entry-level Plymouth in the divisional lineup, Dodge Brothers was twinned with the more expensive DeSoto at dealerships. The match was good. DeSoto dealers would have a crack at the volume market. Chrysler guarded the good name of the brothers Dodge most zealously. It was only in 1934, a good decade after their deaths, that the word 'Brothers' was allowed to be de-emphasized and deleted from the car's crest and insignia in 1939--in the United States. The Canadian market was tiny in comparison to the United States but Chrysler wanted all of the market share it could get in Canada, in the most efficient way possible. In the days before AutoPact, what was built in Canada was sold in Canada and the British Empire. There was virtually no exportation of Canadian-built cars into the US and while American cars ere shipped into Canada on a regular basis, they tended to be high end of the sale models or outright luxury models commanding top dollar. In order to maximize factory efficiency, Chrysler Canada engaged in some clever badge engineering. Starting in 1933 a small Dodge for Canadians only was built in Windsor. In essence it was a Plymouth shell and mechanics decorated with Dodge trim. Purists often refer to them as "Plodges." In 1939 the difference between 'real' Dodges and the homegrown variety became very noticeable when the small Dodge got square headlights like Plymouth. Only by walking up to read the brand name on the brake light was Dodge distinguishable from a Plymouth's backside. Of course Chrysler manufactured big Dodges in Canada, too. Along with the small homegrown Dodge, Chrysler Canada produced and sold a small number of larger, higher priced American-look Dodge Custom models. 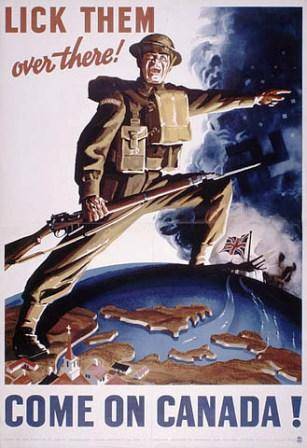 Canada declared war against Germany and Italy in 1939. Workers at Chrysler Canada built many weapons for the war. 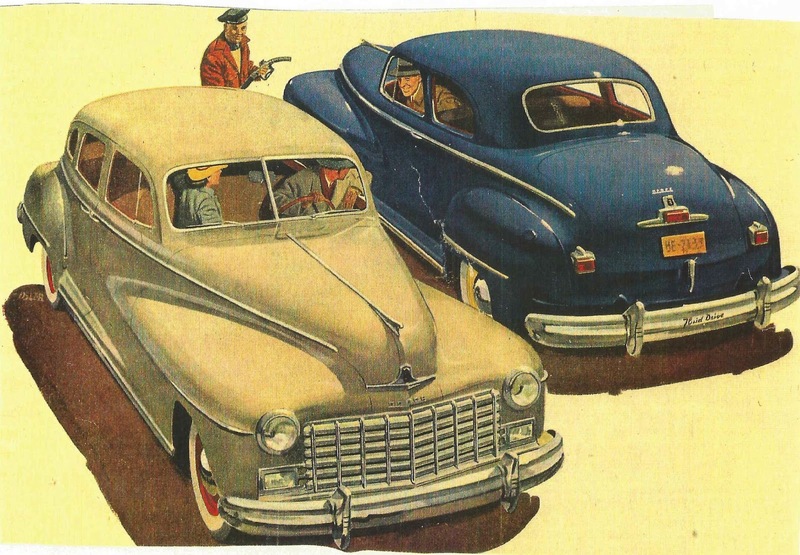 When victory came in 1945, the Canadian auto industry was slow to reconvert its factories for civilian production. A mere handful of Dodge cars--22 to be exact--left the factory gates during the 1945 calendar year. The Dodge product was pretty similar to its 1942 namesake although the heavily-ribbed grille was replaced by a steel tartan weave. Parking lights were placed lower in in the front fenders which now flowed into the door line. The design would continued as was, without change for 1946, 1947, 1948 and the 1949 First Series. 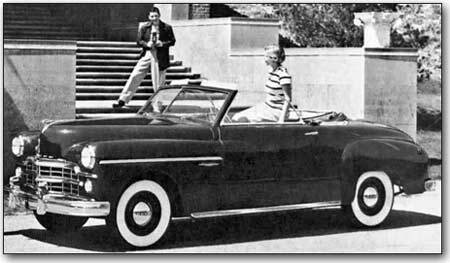 Dodge officials in the US made no attempt to tell them apart, often referring to them in press releases as sthe "1946 to 1948 models". The only difference between a '47 and a '48--besides higher prices--was new, smaller 3812-millimetre (15-inch) tires. The massive seven-passenger Dodge Custom sedan was 457.2 millimetres (18 inches) longer and 226.7 kilos (500 lbs.) heftier than the Custom Coupe. Safety glass was standard on all Dodge cars in 1948. There had been little for Canadians to buy during the war. Manufacture of most consumer goods was suspended completely or rationed. Conversely, the labour force was virtually tapped out. Folks worked around the clock to beat the Axis powers. By war's end in 1945, the average Canadian had money to burn by the fistful. Goods returned to the market and a monumental inflationary spiral kicked in as consumers went on the wildest spending spree in living history. 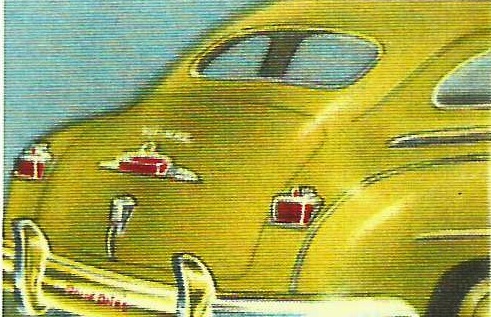 Corporate styling on all ChryCo products from 1946 to 1948 was the centre-mount brake light that cleverly incorporated the license plate holder. The base price of a Canadian Dodge had been traditionally $12 more than Plymouth. 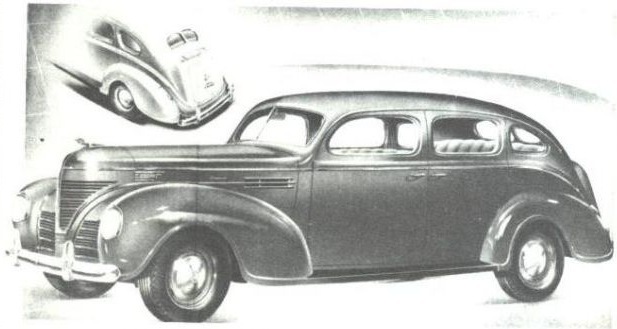 In 1948 Ottawa began to take a hefty bite in consumer taxes, causing an increase of a whopping $30 more for Dodge than for cousin Plymouth. Thanks to a hugry federal government, Dodge's new price range accordingly jumped from a new base price of $1,570 to $1,840 in the domestic market. A Dodge duo at the filling station. The gas tank held 14 imperial gallons and featured a sediment collecting sump. There were the usual "Junior" Dodges but in the senior class of 1948 there were three Custom models: the four-door sedan, the six-passenger convertible and the long wheelbase seven-passenger sedan. Billed in advertising as "The Big Dodges", these Windsor-built models were an important prestige addition to the line as small volume but steady sellers. 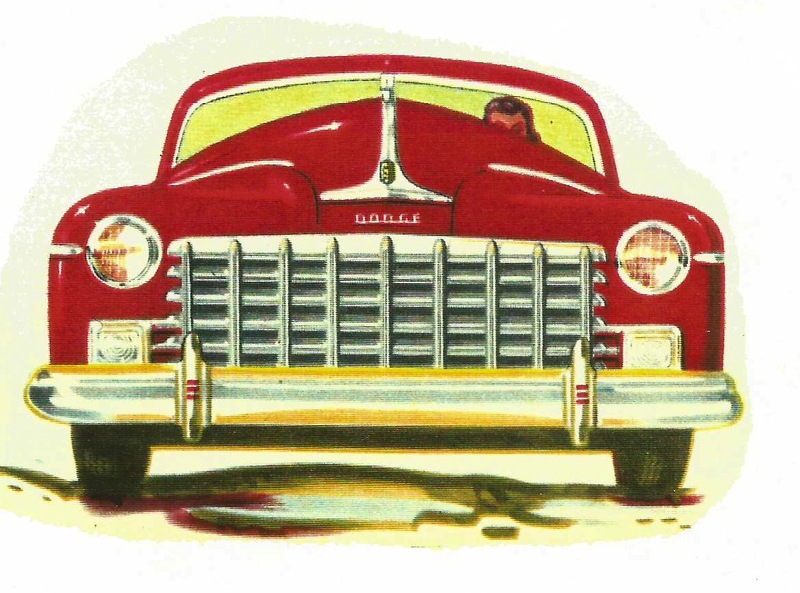 In 1948 Dodge cars for the Canadian market used a 3.7-litre (228.1-cubic inch) six-cylinder engine. This differed from its American cousins. While visually similar to its American cousins, there was a big difference under the hood of a Canadian-built Dodge--a powerplant never seen in the US. Dodge was given a 3.7-litre (228.1-cubic inch), six-cylinder, unique to Canada. Stroke was 85.7 millimetres (3.375 inches) and the bore was 107.95 millimetres (4.25 inches) which resulted in a compression ration of 6.8.1 giving it a slightly higher than the American motor which had 50.8 millimetres (two inches) more displacement. Horsepower was a respectable 105 @ 3500 rpm on the rubber-mounted L-head engine. Another quirky difference shows up under the hood, too. 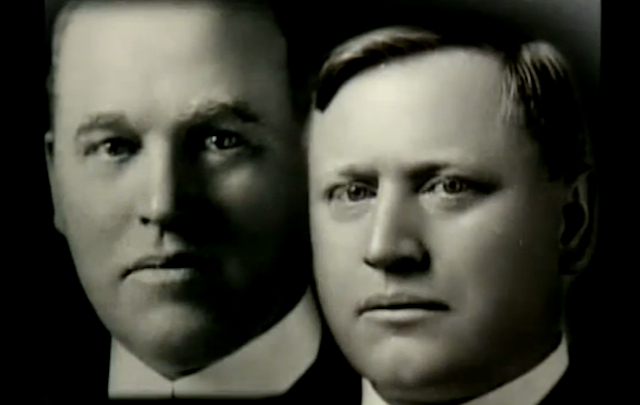 For the final time in the marque's history the firewall plaque read, "Dodge Brothers of Canada." Symmetrical instrument panel made use of non-glare lighting for improved vision. The "Safety Signal" speedometer changed colours as road speed increased. Unlike the small Dodge, the big Dodge Custom offered Gryol Fluid Drive, engineering's attempt at a pre-automatic transmission. Not a true self-shifter, the power was generated by two oil-forced rotors each with fan blades emanating from the centre. 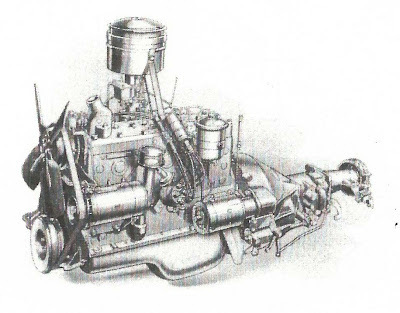 The rotor attached to the crankshaft was called the impeller and the other one, connected to the clutch and transmission was called the runner. As the impeller rotated, it would throw fluid across the gap into the runner which transmitted engine power to the runner and on to the rear axle. Not a true automatic, it was an improvement over conventional driving. Engaging the clutch was not necessary from the starting position, only between low and high ranges of gears. 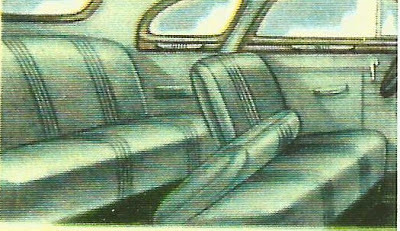 "Tailored upholstery" gave a rich appearance to interiors and advertising promised rise in "...armchair ease as the renowned Dodge Floating Ride smooths out the roughest of roads." When ordering a radio as an accessory, Canadians got a Philco, the fancy model being the eight-tube Transitone. (Americans got MoPar radios.) Other options included a dual heater, trim rings to dress up hubcaps and for the first time since the war ended--whitewall tires. A second brake light was also available as well as fog lamps. There was an unusual standard equipment item, a manual windshield washer, operated by a floor-mounted button. A small feeder pipe carried fluid from the reservoir, through the instrument panel delivering the fluid to the windshield's metal centre divider (the windshield was a two-piece affair in 1948). While Chrysler in the US lumped its 1945 to 1948 production all together, Chrysler Canada broke out production numbers. The Windsor plant turned out 9,474 Dodges in calendar year 1946 and 18,509 units were built in 1947. Things got even better in 1948 when 20,416 scooted out the doors. Dodge was the third best-selling car in Canada in both 1947 and 1948.